For reading, relaxing, or TV watching, nothing beats the comfort of this quality made swivel recliner and matching ottoman. Add comfort and style to your favorite seating area with this handsome swivel recliner set. Both the recliner and the ottoman come in a stucco color faux leather that is durable and easy to clean. And both feature a solid wood walnut swivel finish base. The recliner swivels 360 degrees. Ottoman opens to reveal storage for magazines or a remote. 40" high x 32 1/2" wide x 35 1/2" deep. Reclines fully to 32" high x 33" wide x 50" deep. Holds up to 300 lbs. Weighs 49.6 lbs. Seating area is 20 1/2" wide x 21 1/2" deep x 18" high from the floor. Ottoman is 19 1/2" wide x 18" deep x 16 1/2" high. Arm rest height is 6 1/2" high overall x 23" high from floor. Backrest is 26 1/4" high. Morgan swivel recliner with matching ottoman. Recliner swivels 360 degrees. Stucco faux leather. Solid wood walnut finish base. Swatch fabric available upon request. Ottoman opens to reveal storage for magazines, remote controls and more. 1.8 density foam. Steel springs. Vacuum and brush away dust and grit as necessary with a soft brush attachment. Clean along stitch seams, creases, and spaces that touch skin. Wipe with soft clean-dye fast cloth dampened with plain water. Use high-quality leather cleaning product, or a mild non-detergent, non-alkaline soap. Do not use solvents or detergents. I need to replace my worn out ottoman... is this possible ? Can you purchase the chair without the ottoman? BEST ANSWER: Unfortunately, this chair is only sold as a set with the ottoman. I am only interested in vegan- faux leather- materiL but it says materials: leather? BEST ANSWER: This chair is not made of real leather. It is faux leather. I love this chair, it is so comfortable, and a nice addition in my bedroom. Does the Morgan Stucco Faux Leather recliner come with rollers? BEST ANSWER: I'm not sure what you mean by rollers - it does not have wheels on the bottom of the chair or foot rest - what you see in the picture are little feet - it is not heavy and I move it around the room easily - I hope I answered your question. BTW - I couldn't be happier with this chair - it fits a woman perfectly, it feels like leather and has a substantial feel to it (not cheap) it was a super value for the price. No. The circular base is very sturdy, and the chair swivels on the base. No, there are no rollers. We really enjoy this chair! Are there photos of the chair in the reclined position? BEST ANSWER: I'm sorry, we do not have any photos available for the chair in the reclined position. The recliner measures 32" high, 33" wide, 50" deep when fully reclined. How many reclining positions are there? Does the back recline -- or does the footrest just pop up? I'm looking for an extreme recline. BEST ANSWER: The foot rest is not attached to the chair. There are not really "positions " that it reclines to - it is s smooth grade and you can stop it anywhere. It does recline a lot but not "extreme" like flat. I love this chair, it is very comfortable- would not trade it for any other. the back of the chair does recline, there is no attached foot rest. With the ottoman in proper position it is very comfortable. Caution, the ottoman should not be used as a seat, it can tip over, I have fallen off a few times, fortunately soft carpeting below! I have the chair & ottoman. 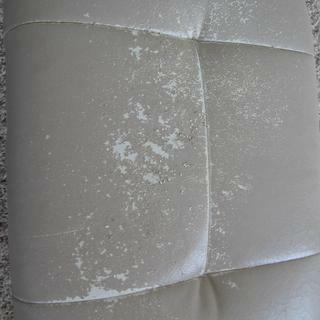 The upholstery is completely shot, it is all peeling off, what a mess. Am adding 2 pic's 1 of the chair & 1 of the ottoman. No more Benchmaster product for me. We purchased the set 02/14/2012 and it is in a livingroom that is hardly ever used. All my other furniture is leather, same color, no problems there and they are a lot older then this set is. Love my chair-fits my body perfectly. Made more for a woman rather than a man - but guys say it is ok.
Wouldn't trade it for anything- super value for the price. like the size and comfort of the chair, swivel is great, with ottoman in proper position it is very comfy. the ottoman should not be used as a seat, it is not balanced for sitting and I have fallen off a few times. Just got the chair assembled (what a job) but so far really like it. The style is very different from what I would normally have chosen. Would recommend it to friends. We have purchased many items from Lamps Plus in past years and have always been very satisfied with purchases. In this recent situation, we were searching for a recliner chair with ottoman. We wanted two chairs for home use. The Lamps Plus Store had a dark brown version of the Morgan Stucco Faux Leather Ottoman and Swiveling Recliner on display in their showroom. We tested the chair and were very satisfied with comfort ability and overall appearance. Unfortunately, we did not want two dark brown color chairs. Rather, we wanted a lighter, perhaps cream-colored faux leather. The manufacturer offered a stucco faux color. The Lamps Plus Store ordered two "lighter color" chairs for us. When chairs arrived at the store, the staff assembled the chairs for us. This was part of their overall service. We picked up the two chairs and took them home. The chairs looked good in our house. Unfortunately, beyond "good looks," neither chair was acceptable. We returned both chairs to the Lamps Plus Store within three days. 1. Both the chair seat and reclining back support felt like we were sitting on "concrete slabs." They were that hard! 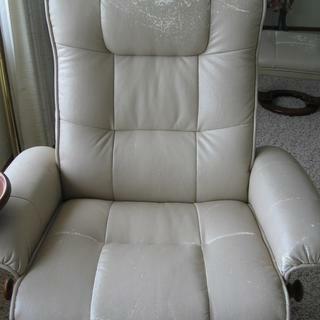 We have owned Scandinavian recliner chairs with footstools for 15+ years. They are showing wear. Hence, we wanted to replace them. 2. Swivel action on both chairs was difficult to use. It took considerable effort to rotate the chairs. 3. The bottom of the chair ottoman (both chairs) had rubber stopper type feet. The only way to move a ottoman was to physically pick up the ottoman and carry it to where we wanted an ottoman placed. We have carpeting in the room where we wanted to use the recliner chairs/ottomans. Needing to physically lift and move an ottoman was not workable for our needs. 4. The reclining feature of each chair was difficult to use and control. This made the reclining back very uncomfortable. Over past years, we have purchased several items from the Lamps Plus Store that services our area. The staff is great to work with. They are knowledgeable, patient, honest, and willing to stand behind items purchased from them. When we returned the two recliners/ottomans to the Lamps Plus Store, staff listened to our reasons for returning the two stores. Without hesitation, they accepted the returned chairs/ottomans and processed a full credit card refund of our purchase prices. Please note that our "2 Stars" overall rating relates to the reclining chairs/ottomans. If there was a separate rating for the staff of the Lamps Plus Store, we would have rated the staff and store as "5 Stars." Hi Richard L., we appreciate the review. We do apologize if these recliner chairs were not suitable for your needs, and we encourage you to reach out to your local store or our customer service team via phone, email, or chat if you have any further questions or concerns. Thank you. Beautiful and comfortable chair. Looks luxurious. My wife saw this chair and sat in it. She said she had to have it which is a little strange since we had just purchased new living room furniture. I had to agree with her. A really comfy chair! Great chair! It is well made and very comfortable. Hi Diane R., sorry to hear that one of your chairs was defective. Our customer service team has assisted you with this, but they look forward to any questions or concerns you may have so they can continue to help. Thank you.